Armadillo keeps to himself, ignoring the neighbors he passes each day on his way to hunt for grubs. He never bothers with the lively green snake, the shy rattler, the old tortoise, the scrub jay, or the honeybees who live near him in the orange grove. 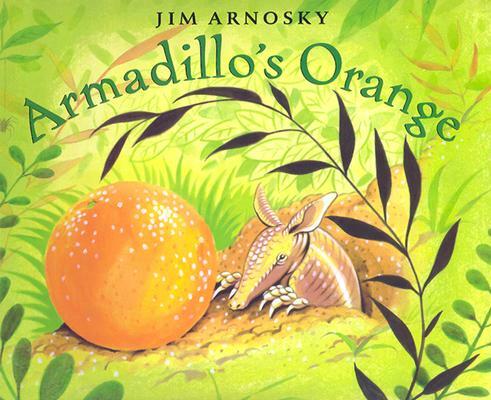 All that matters to Armadillo is the big, round orange that marks the entrance to his burrow. Then, one windy day, his orange rolls away. Alone and confused, Armadillo must figure out a new way to find his home-and discovers that when it seems all is lost, his neighbors will always be there to help him. In a deceptively simple treatment, Jim Arnosky explores the value of friends in a constantly changing world, and reminds us that home is where your neighbors are.